I was never a huge Bruce Springsteen fan. I know the man’s talented but I didn’t see what all the hoopla was about. Like most singers of his caliber, there are certain songs of his I enjoy but I didn’t go all crazy over him the way most people did. I have, however, always enjoyed hearing him sing Santa Claus Is Coming To Town. It’s just a fun song in the first place and Springsteen adds his own twist to it that makes this classic just a little bit more so. 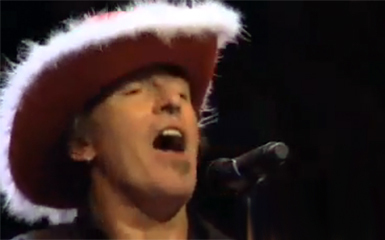 He really rocks out on this old standard and he, his band, and the audience just gets so much pleasure out of it that it has become a holiday radio staple. And rightfully so. Seeing The Boss sing this one live is a real treat. He doesn’t let the energy level drop for even a second and I have always liked to imagine that somewhere, far away, maybe at the North Pole, Santa himself is cheering right along with everybody else anytime Springsteen lets loose.